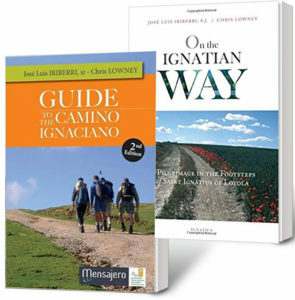 Together with Jose Luis Iriberri, SJ, Chris has authored the definitive guidebooks to a remarkable new pilgrim trail, called the “Ignatian Camino,” or Ignatian Way. Chris worked with the Jesuits of Spain to develop this trail, which traces the route of Ignatius of Loyola’s famous 1522 journey from his home in Spain’s Basque country to Montserrat and Manresa. The guidebooks offer practical guide to the route, a brief history of the era, a retelling of Ignatius of Loyola’s life story, and a prayer guide. The Ignatian Camino has been soaring in popularity since its founding a few short years ago. Maybe you too would like to walk or cycle the route? The camino’s official website offers all the details (together with the Facebook group, “Friends of the Ignatian Camino”); or, use Chris’s contact page to request more information about the route, which begins in Ignatius’s birthplace and winds hundreds of miles through picturesque mountains, lush vineyards, and some lonely desert terrain before ending in Manresa, where Ignatius wrote his spiritual masterpiece, the Spiritual Exercises.